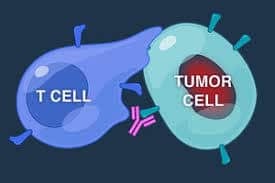 Original Article from The New England Journal of Medicine — First-Line Atezolizumab plus Chemotherapy in Extensive-Stage Small-Cell Lung Cancer.. Enhancing tumor-specific T-cell immunity by inhibiting programmed death ligand 1 (PD-L1)–programmed death 1 (PD-1) signaling has shown promise in the treatment of extensive-stage small-cell lung cancer. Combining checkpoint inhibition with cytotoxic chemotherapy may have a synergistic effect and improve efficacy. We conducted this double-blind, placebo-controlled, phase 3 trial to evaluate atezolizumab plus carboplatin and etoposide in patients with extensive-stage small-cell lung cancer who had not previously received treatment. Patients were randomly assigned in a 1:1 ratio to receive carboplatin and etoposide with either atezolizumab or placebo for four 21-day cycles (induction phase), followed by a maintenance phase during which they received either atezolizumab or placebo (according to the previous random assignment) until they had unacceptable toxic effects, disease progression according to Response Evaluation Criteria in Solid Tumors, version 1.1, or no additional clinical benefit. The two primary end points were investigator-assessed progression-free survival and overall survival in the intention-to-treat population. A total of 201 patients were randomly assigned to the atezolizumab group, and 202 patients to the placebo group. At a median follow-up of 13.9 months, the median overall survival was 12.3 months in the atezolizumab group and 10.3 months in the placebo group (hazard ratio for death, 0.70; 95% confidence interval [CI], 0.54 to 0.91; P=0.007). The median progression-free survival was 5.2 months and 4.3 months, respectively (hazard ratio for disease progression or death, 0.77; 95% CI, 0.62 to 0.96; P=0.02). The safety profile of atezolizumab plus carboplatin and etoposide was consistent with the previously reported safety profile of the individual agents, with no new findings observed.